Over the years, I’ve learned that I am not a stock market investor. I’m also not a real estate investor. Although I do like dividend growth stocks, index funds, and rental properties, I do not have an unrelenting affinity for any of those investments. The same applies to U.S. dollars, bonds, and just about any other type of investment out there. At the end of the day, I am a financial independence investor. I will utilize whatever means that I can to help me to get to early financial freedom quickly. They say that history doesn’t repeat itself but it merely rhymes. I don’t necessarily agree with that statement… As I’ve observed over the course of my life, people seldom learn from their mistakes. Although future events will never mirror what happened in the past exactly, for most intents and purposes, they are a close enough resemblance for any investor to exploit. 7 years ago, the world witnessed a market crash of epic proportions. Fear was paramount, and no one was investing. Since that time, the markets have staged a roaring rally, with the S&P 500 up over 200% since bottoming out in March of 2009. Ditto for most other stocks and real estate. Times are good again, and the participants of the game today are just as greedy (or more so) than ever before. Bank holidays, bail-ins, negative interest rates, more austerity, Chinese government interventions to keep markets from collapsing, hyperinflation, etc. are NOT signs of economic growth and prosperity! As usual, many people will choose to remain oblivious to world news and won’t care one iota until they themselves start to get affected directly. Fortunately, there are those who DO care! And anyone who is paying attention right now may be able to profit massively from the chaos in the near future. With U.S. stocks, currently, the Shiller PE Ratio sits at: 26.72, while historically, it should be closer to 16. That’s an easy indicator showing us that overall market valuations are indeed stretched. Housing is very much a local phenomenon, and the above won’t hold true for every market out there. But expensive real estate can be found across many locations: NYC, D.C., Seattle, Canada, Australia, Singapore, etc. But so many investors just don’t care. It’s business as usual… BUY, BUY, BUY!!! As an investor who is extremely motivated to “buy low and sell high“, I can assure you that I have learned to pay very close attention to just exactly where we are in a given market cycle. For the most part, I do believe that markets are merely a function of waves, oscillating back and forth, from lows to highs. Right now, almost all indicators are telling me that the mainstream markets are too frothy! But that won’t persist indefinitely. The tide will turn again… It always does. In the meanwhile, I’ve learned to become a student of history. Not only do I follow the broader stock market, but these days, I’ve also tuned in to the commodities sector as well. In my spare time, I analyze and plot charts. Lots of charts. To keep things extremely simple, I will borrow some surface-level charts from Macrotrends. As you can observe, each investment has had its time in both the sun and the doghouse. Had you purchased shares of the Nasdaq at the top way back when, you would have had to wait from March 10, 2000 until June 18, 2015 to break even on your investment! That’s 15 years you would have been in the RED! 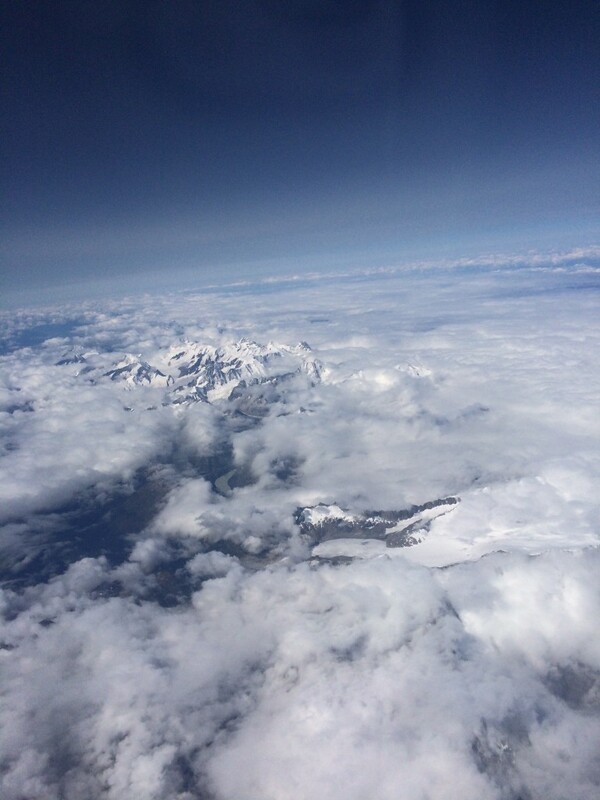 Quite frankly, you don’t even need to catch the exact peaks and valleys, either… You just want to be headed in the right direction. An investor who would have realized that the stock market was in bubble territory back in 1999-2000, could have decided to swap out of stocks and into a more undervalued asset, such as gold. 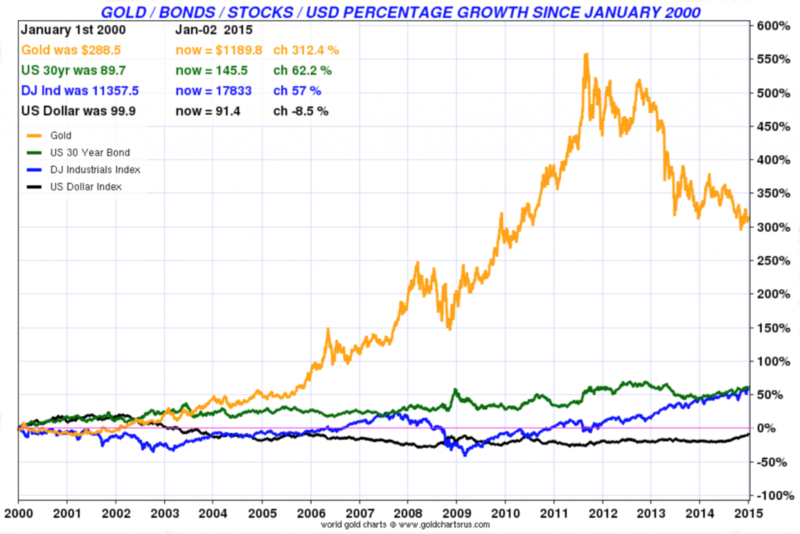 From 2000 until 2011, gold went on a tear, up ~500%, easily outperforming stocks and bonds. Again, it isn’t necessary to time the cycle perfectly… Whether you sold out of gold when it was up 200%, or 300%, or if you were lucky 500% (at the top), in all cases, you would have been much better off than had you stayed fully invested in stocks and bonds. 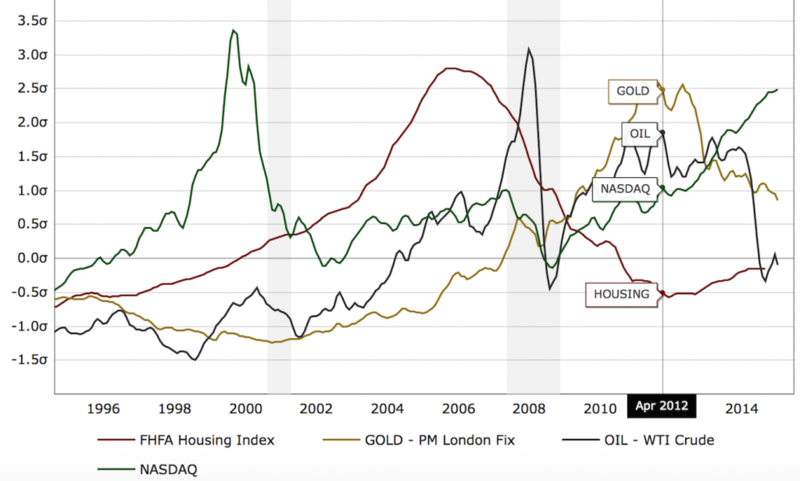 Anyone who would have had the intuition to get out of gold around 2011-2012, and could see that real estate was an EXTREMELY UNDERVALUED asset would have made a fortune by swapping out of gold and into real estate. You don’t need a lot of skill… But if you can see the developing trends unfold, you can set yourself up to create generational wealth. So far, I’ve only participated in one wealth cycle (the bull run up from 2009-present), and in just that time span alone, I was able to become a net worth millionaire. What did I do correctly? Well, I didn’t have the knowledge or education that I do now, but I was at the right place at the right time (dumb luck). I poured all my money into real estate (repeatedly) and made more in a few years than I ever would have expected to in a lifetime. Who needs “slow and steady” if you understand valuations and know when an asset is truly undervalued? That’s when you should be buying hand over fist and backing the truck up, as investors so often claim that they will do when opportunity comes knocking. In my experience, opportunity really only bangs on the door when there is blood in the streets and despair in the air. Though I should caution readers — Even when you are “backing the truck up”, it’s ALWAYS prudent to invest with caution and to not take any undue risks that you are not comfortable with. Regardless of what you decide to do, ALWAYS have a plan in place to limit your downside and protect your overall portfolio! Investing is NEVER risk-free! Looking back in time with the benefit of hindsight is easy to do. So, what can be done today? 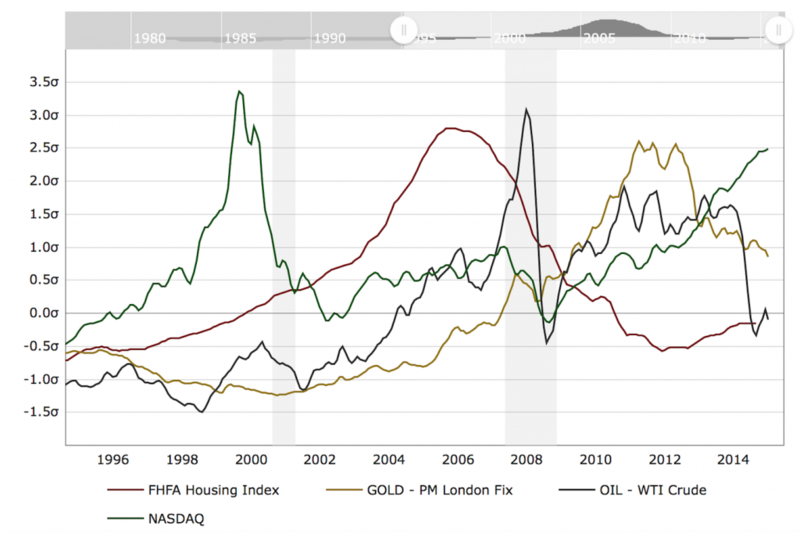 As mentioned earlier, I see the broader stock markets as overvalued… Further, although the above chart shows real estate as relatively affordable, I have to again keep in mind that real estate is very local. In other words, you can’t take any chart at face value and you must know what it is that you are looking at. As it pertains to my own situation, this chart definitely would NOT apply to the Bay Area. In my own opinion, Bay Area real estate is just as overvalued (if not more so) than the general stock market! In any case, when I observe the following chart above, I can conclude that oil and gold are entering oversold and undervalued territory. WTI crude is now trading under $50 a barrel, and as many are aware, oil and energy companies have been absolutely battered this year. Blue chip stocks such as Exxon Mobil are down ~20% year-to-year. 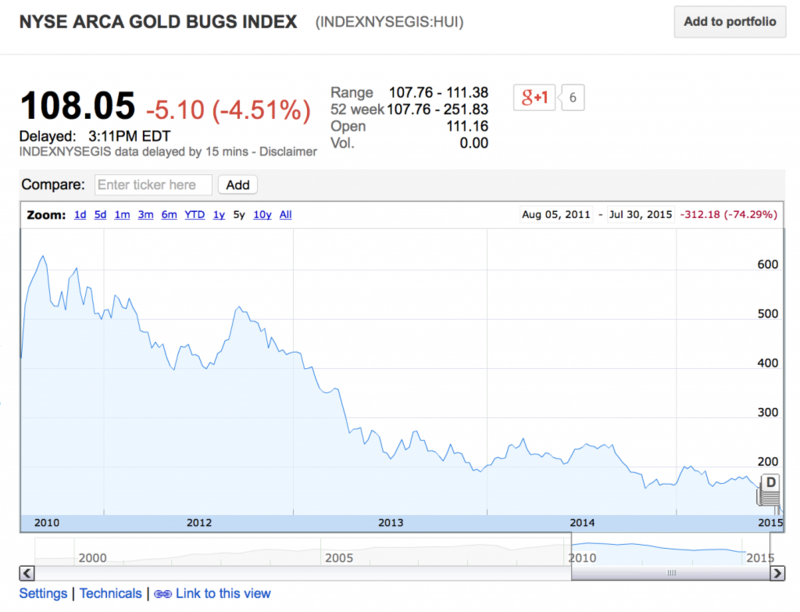 As for gold, I am becoming increasingly certain that the final capitulation is in the air. Gold is currently trading below $1,100/oz and many analysts are predicting for sub $1,000/oz prices before year’s end. Gold is down almost 50% since peaking at $1,923/oz back in April 2011. The mainstream media has started to unleash an onslaught, attacking gold as nothing more than a pet rock and predicting an even further decline down to $350/oz! As always, I should be explicitly clear — I am NOT a financial adviser and am not in the position to advise anyone on how to invest their own money. Please consult with a certified professional if you have any questions, or want investment guidance. Markets go up and down all the time. You will always have your bulls and your bears. In my view, the beauty of it all is that different assets don’t always move in tandem with one another. 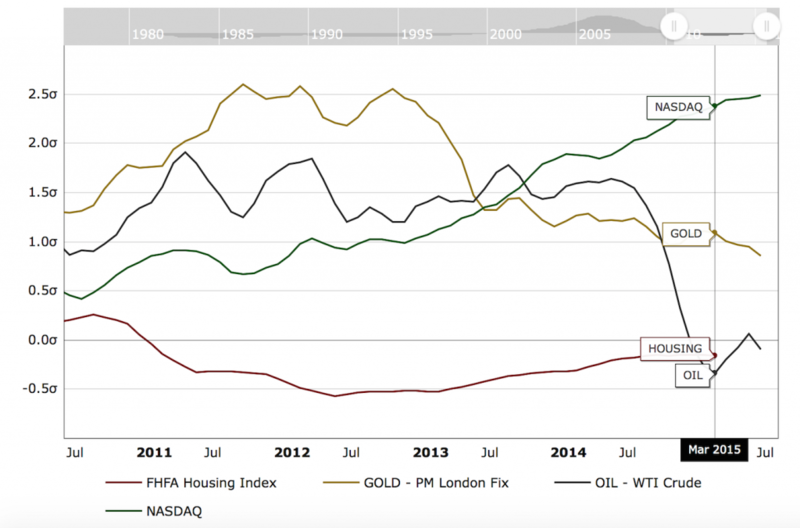 So, even if the local real estate market is booming (like it is today in the Bay Area), you can still search across different asset classes, like oil and gold, to find heavily discounted valuations. Because of falling prices, I am heavily fixated on oil and gold right now; I’m trying my best to be a patient investor as I watch events unfold. At some point, though, we will reach a final bottom where the upside becomes tremendous, and any remaining downside, minimal. And those are exactly the type of investments that I want to get into. Because after all, I am a financial independence investor! I don’t invest in stocks or real estate exclusively. I believe in market cycles. In 2012, I hopped aboard the real estate train. I didn’t get in at the absolute bottom, but it didn’t matter; prices were dirt cheap… There was a ton of upside and hardly any remaining downside. 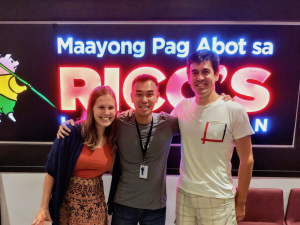 By getting in the right assets at the right time, I catapulted my early FI progress and was able to eclipse my first $1MM. You don’t have to be that smart or bright to make money. I’m definitely not. Luckily for you and me, the masses keep on making the same mistakes. Over and over again. History just keeps repeating itself. And when the next collapse inevitably arrives, there will again be doom and gloom in the air. When the dust settles, I’m hoping to take advantage of the disaster so that I can turn my $1MM into $2MM. I appreciate your perspective here. All of these equities and financial ‘products’ are just tools for me. Means to an end. And although I’m learning a ton about the tools, the companies, and the people behind them (that in and of itself is fascinating), I’m really here for the promise of future freedom. Flexibility to deploy my time wherever I want because I deployed my money wisely at a young age. All of your graphs make me smile. There are underlying patterns that we need to recognize, and that you pointed out so clearly. All markets will eventually have their correction applied. Right now I’m taking discounts where I can get them in oil, knowing full well that there is risk in being over weight, but also knowing that I will have time to dip into other sectors when they correct. Thanks for stopping by. I agree with you that financial products are simply tools that we can use and take advantage of to help us achieve financial freedom. I’ve always felt that getting too emotionally attached to a technique or investing style is to do yourself a disservice… I feel like there’s a time and place for all types of different investments. Being overweight in any one sector will always carry a degree of risk, but if you are right with your conviction then it’s also by far the fastest way to accumulating a lot of wealth. Not the safest strategy by any means, but most investors who I’ve met that were able to achieve great success in a short period of time did so by going “all in”. In hindsight, that’s also the same thing I did for myself. Is that aiming that there were no further investments AFTER the year 2000? Isn’t there a case a case for staying the course and investing on the way down? I’ve heard the analogy of ‘trying to catch falling knives’ which I like. A 1 time bulk investment relies entirely on having luck in timing the market. ……doesn’t it? Again, it has to do with limited remaining upside and a lot more downside risk. Wonderful investment opportunities will present themselves from time-to-time. The truly amazing deals don’t come around often, so a shrewd investor must be prepared when the time arrives. Thanks for your swift response FiFi. We are at opposite ends of our early retirement careers. I would love to get into real estate where I live (Gothenburg) but right now there really is no swing room within my budget…….but I have plans…..oh yes, I have plans. Within a decade I will be free, although through reading your blog freedom has become a mindset. So im alreadu free. Best wishes on your early FI journey! Having the right mindset is half the battle! Very interesting charts FI and great analysis. Like you mentioned, housing market is very local so the charts may not reflect the housing market in your area. But seems that oil related stocks are worth it to stock up. Yup, real estate is very local so all my ramblings won’t necessarily apply to your own market, or many others. As always, it’s important to interpret the context of the article. It is becoming an increasingly attractive investment. The patient investor will be handsomely rewarded. 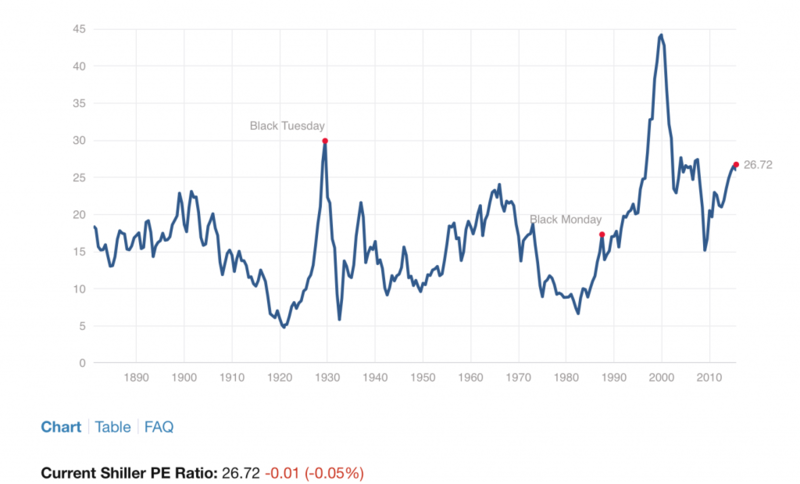 I’m a big hater of the Case-Shiller P/E ratio, or PE10. We are perpetually “overvalued” by that metric, which means that Robert Shiller has been a permabear on the stock market for essentially forever. By using the PE10, an investor would have sold their stocks around 1992, and would have bought back in around in spring 2009, would have held their shares for about a month, and then sold again. What’s the point in looking at the last ten years of earnings? To capture the full economic cycle? Aren’t we capturing the full economic cycle is just the normal P/E? In a normal P/E (or better yet, forward P/E), companies that are more immune to cycles (PG, JNJ, MCD) get higher P/Es. Cyclical companies get lower P/Es (XOM, DE, WFC). Thanks for posting though. That is just my little pet issue in an otherwise awesome and thorough post. Much appreciated! Thanks for your comments and great points there. In the article, I mentioned the chart as being an “easy indicator” for someone to observe general market trends; by no means is it perfect. And you are right, additional analysis is warranted. 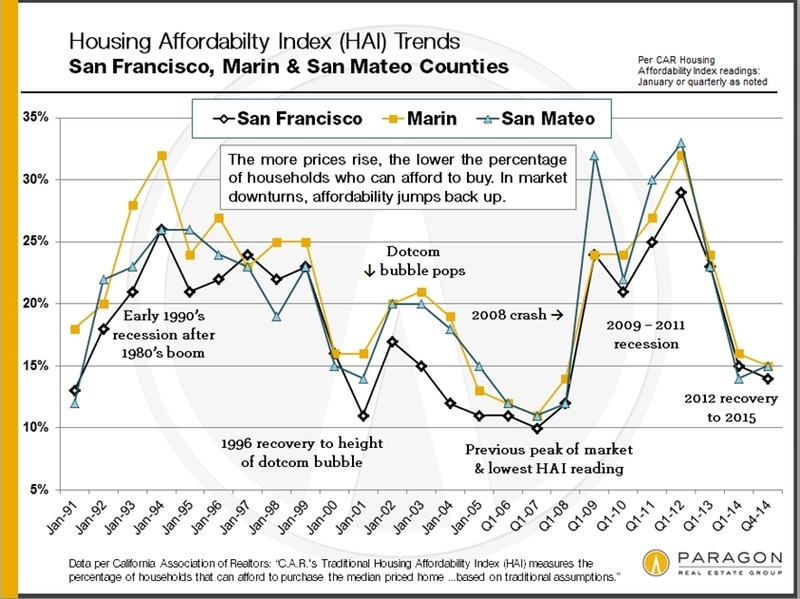 This is also true with the HAI that I used to show that Bay Area properties are expensive and overvalued. For myself, I use charts like these more for indicators of fear and greed. When markets correct and cycles shift, the corrections are usually fierce and we enter regions of extreme undervaluation. The HAI shot up to over 30% which is a great surface-level indicator to start paying attention to the markets again! Further, even though I concluded that the overall market was overvalued at this time, like you suggested, more analysis will show that certain sectors, such as oil and energy, are correcting right now and don’t apply to the overall general trend. Other useful measures would be to look at the VIX or Fear and Greed Index, etc. There are lots of great tools out there. I should add that even if an investor is interested in investing in a niche sector, it’s always a good idea to pay attention to where the broader overall markets are. So, for example, even if a sector such as oil and energy looks cheap relative to the entire stock market, if the indexes are overvalued, at some point they will sharply correct and the markets won’t care if any particular sector is already undervalued. It will plummet alongside the broader market. 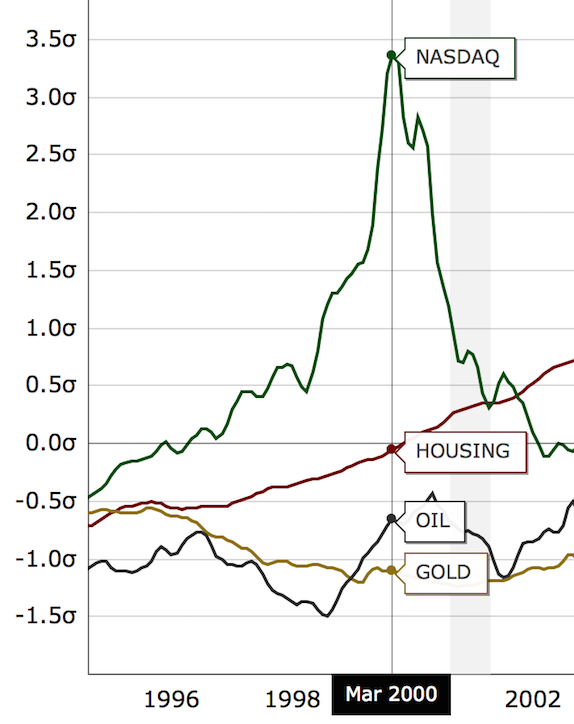 The chart you show is variation on the 4 markets. Where did you get those charts? We know from history that the higher variation mean that it is going towards a bubble. Does your source on the charts talk about what the variation is and how it correlates to the market? For every seller, there must be a buyer. So, prices are almost always at an equilibrium. You can guess sectors, or buy all sectors. The commodity market is screaming deflation and economic slow down. Hindsight will be perfect, but the tried and true method is slow and steady. Index investing wins most other trading mechanisms. Index investing works great and the slow and steady approach will serve an investor well in the long-term. One of the things I think to keep in mind is that China, the Middle EAstand to a lesser extent India/Brazil etc have only recently become players on the world economy. China in particular has significantly different rules and laws surrounding property rights. The wealthy in many of these countries have resorted to alternative assets to hide/protect their financials gains. The Chinese up until recently were one of the largest owners of gold. Some of what we are seeing in gold is because of two things. 1) the dollar going up in value against most other currencies, and this is pushing the cost of dollar denominated assets like commodities down. 2) The Chinese are liquidating positions in liquid assets like gold to pay for margin calls/protect investments in the Chinese stock market. I think we will see continued liquidation of gold positions for a while until the Chinese markets stabilize. And perhaps longer if we see a recession in China. Oil on the other hand I think is really due for a rebound. There may be some more short term downside but I think it is headed up and quickly when it does. The CEO of Corelabs did an interview and talked about how he thought there would be a significant fall off in US crude production by the end of this year (I forget exactly but I think he mentioned 500K Barrels/day. He also said the Saudi’s and the Russians were pushing their wells too hard and they were getting water into the wells so that their production would fall off substantially sometime this year. Based on how poor the earnings were for the Big Majors last week, I think we see a little more downside in stock price, and I wouldnt be shocked to see capitulation in oil take the price below $40 on WTI, but then I think we will see a rebound. My shopping list includes the big oils like XOM, and I like KMI as a pipeline. I also have some EOG as a pure domestic & spec play, and I may add to it. Thanks for the insights. China also recently announced their gold holdings and although it was about a 60% increase from 2009, it was a paltry figure from what many analysts were expecting. I can’t speculate and say I know what their plans are, but it’s been no secret that China has been a large buyer of the precious metals, and may be looking at keeping prices suppressed as they continue to load up on supply. They are the largest consumer and don’t export a single ounce offshores. 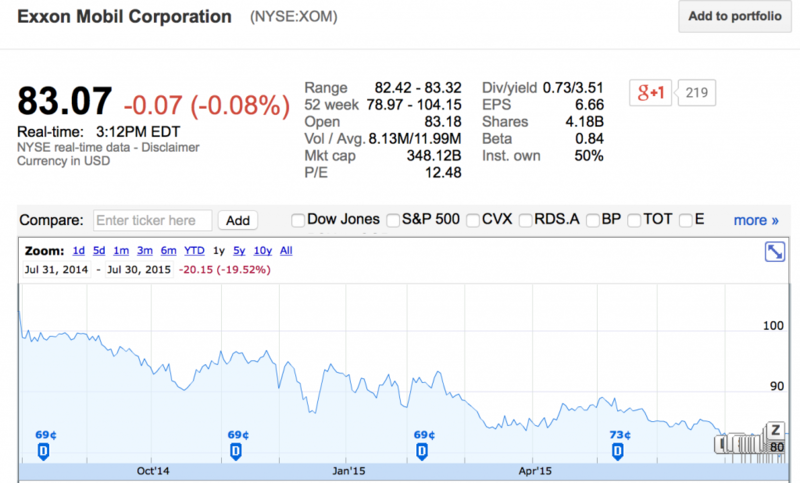 With oil, the recent poor earnings from the big majors XOM and CVX would indicate to me that the worst is still to come. Below $40 WTI is very realistic and I will be waiting for a bounce and stabilization before I look to add assets into my portfolio. It’s very tempting to jump in now, but I think buyers will have a lot of time as this saga unfolds… I did purchase some KMI recently and although it was a trade out of another stock, it was my first foray into the energy sector… Bits and pieces which should pay off in the long run. I like your list of stocks — I’m watching KMI and XOM carefully. CVX, COP, RDS.B, and some of the more ‘risky’ explorers as well. I love your point about being a Financial Independence investor! I know that a lot of investors striving for Financial Independence just believe in investing in index funds – they believe that this approach has little risk in the long-term, and that it will allow them to retire comfortably with around 4% annual withdrawals. I prefer your approach. You understand the concept of buying low and selling high, and I think that this is a quicker, more efficient way to achieve Financial Independence. Love seeing your posts, and Go Bears!